Since the beginning in 2005, Crêpeaffaire has been growing in the UK and beyond, bringing flipping awesome crêpes to more and more people. We now have 15 UK locations as well as units in the GCC and the Netherlands. Our founder, Daniel Spinath, is making exciting plans to take on the U.S next, after proving that crêpes are a global food, universally loved by so many! Daniel sees great opportunities across the U.S. and looks to pursue partners in the local marketplace. Appealing to a wide range of people, Crêpeaffaire holds a unique Continental and French flavor with an contemporary modern twist. We cater for those who are eating in any time of the day, or wanting something delicious and different to grab-n-go. “Crêpes are the perfect envelope for all kinds of fillings, anywhere, any time, for everyone” said Daniel. He is passionate about the lifestyle brand, where consumers can watch their savoury or sweet crêpes being made from fresh by our Crêpemaster chefs in front of their eyes, using organic flour and natural ingredients. You can catch Daniel discussing his crepe philosophy at the 2018 Restaurant Franchising and Innovation Summit, July 16-18, in London. This will revolve around taking Crêpeaffaire beyond the UK and how we are positioned in the quick casual food segment, with indulgent or healthy alternatives to tradition fast food services, including free-from and vegan menu offerings. We’re excited to roll out our speedy crêpes, waffles and mini pancakes to new areas after they’ve taken off successfully around the country; such as the launch of our first Crêpeaffaire Mini, serving mini sweet pancakes at KidZania (a London kid-run pretend indoor city). Fancy a visit? You can see all of our Crêpeaffaire locations here! 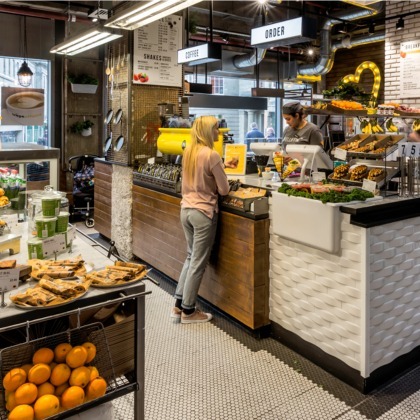 Why not check out the full press article in the link here: “Franchising focus: London’s Crepeaffaire testing global boundaries”.